This is how I usually prepare artichokes for our family. It’s the easiest, most straightforward way to make them. Give me a steamed artichoke and a dish of good-quality mayonnaise (or hollandaise!) and I’m a very happy camper. Rinse your artichoke under cold water. Pat dry with a clean kitchen towel or paper towel. 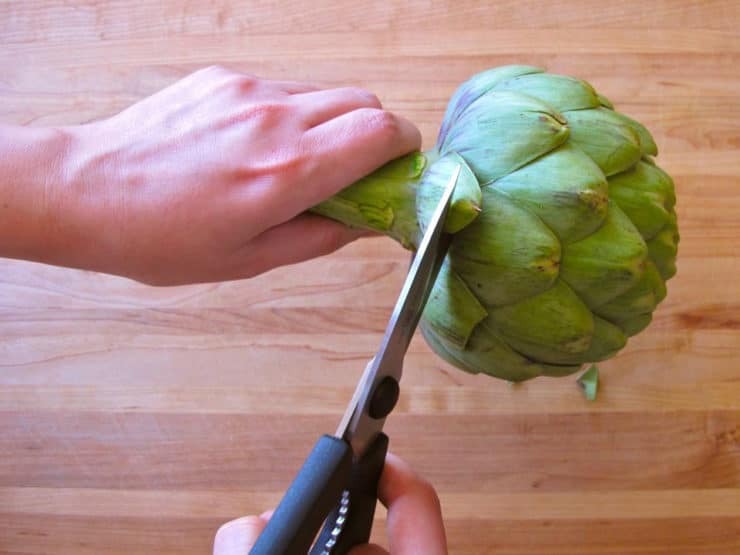 Remove any stray leaves from the stem of the artichoke. 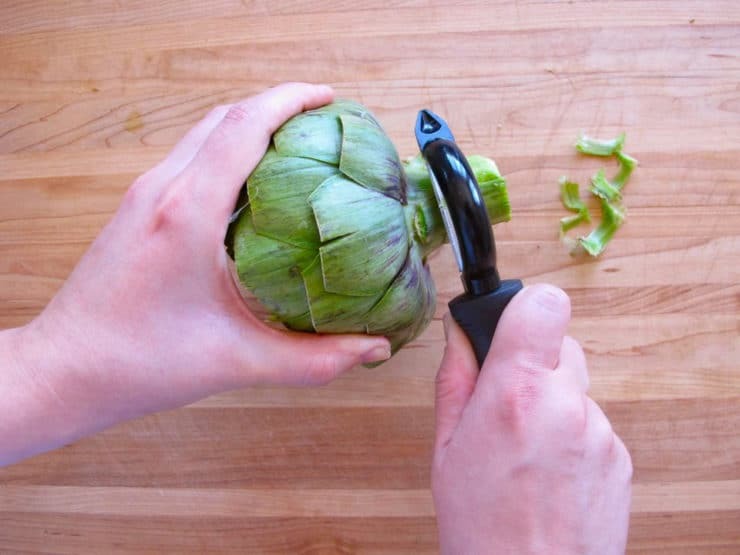 With a sharp chef's knife or serrated knife, cut about an inch off of the top of the artichoke. Keep a lemon handy to rub onto the exposed areas so that they do not oxidize and turn brown. 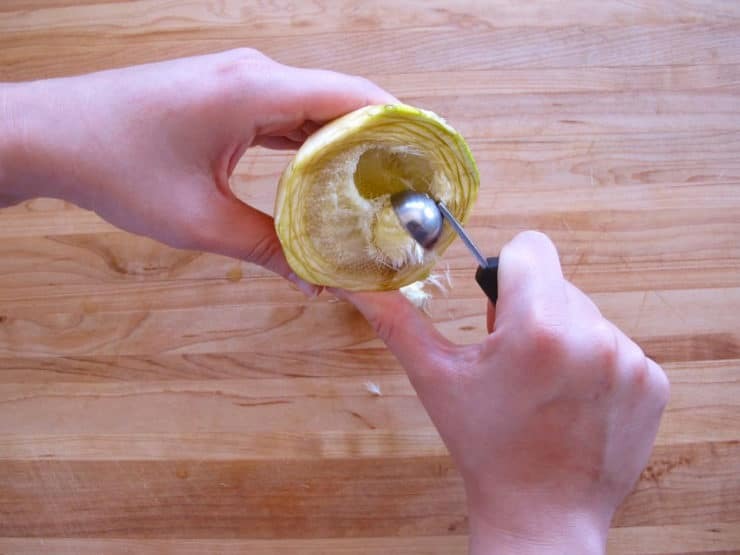 Peel the outer skin from the remaining stem. 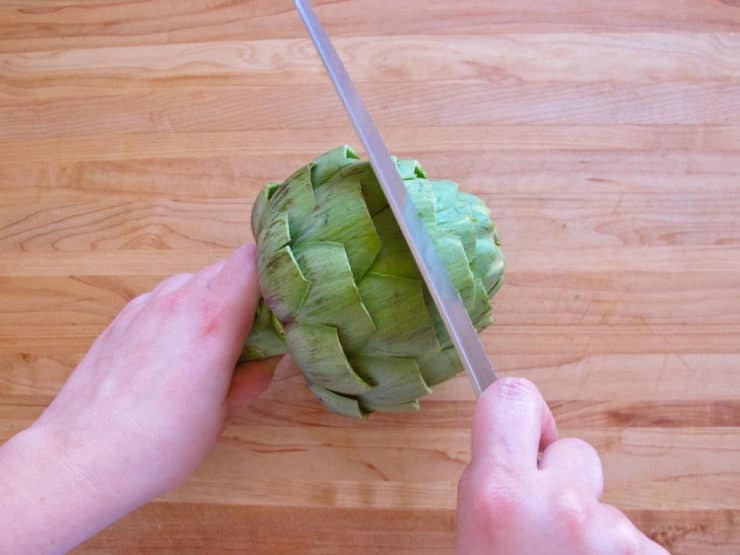 The stem can has a more bitter taste than the rest of the artichoke and removing the skin helps to take away some of the bitterness. Rub exposed peeled stem with lemon. 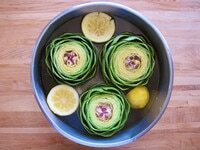 Run the artichoke under cold water, pulling apart the leaves to carefully rinse out the vegetable and remove any impurities. 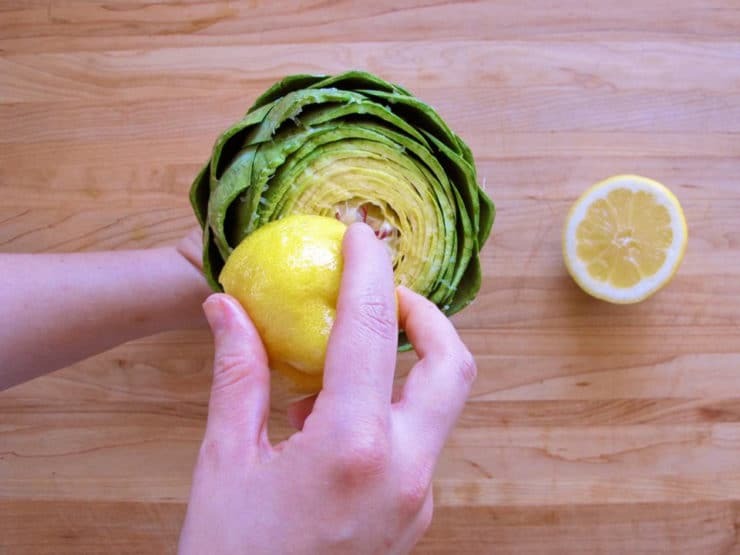 Immediately submerge the prepared artichoke in a bowl of cold water with lemon juice. Keep prepared artichokes in this lemon water till ready to steam. When ready to steam, fill the bottom of your pan with a few inches of water. 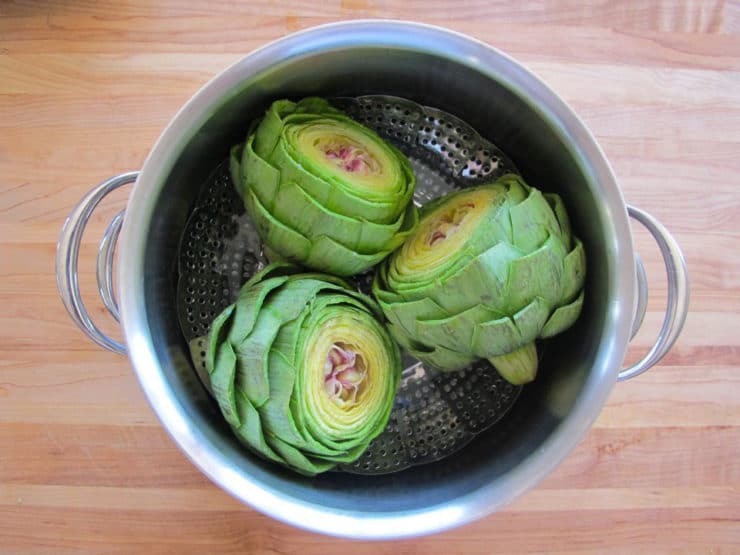 Place a steaming basket in the bottom and the artichokes on top, cover the pan with a lid. Bring to a boil then reduce to simmer. 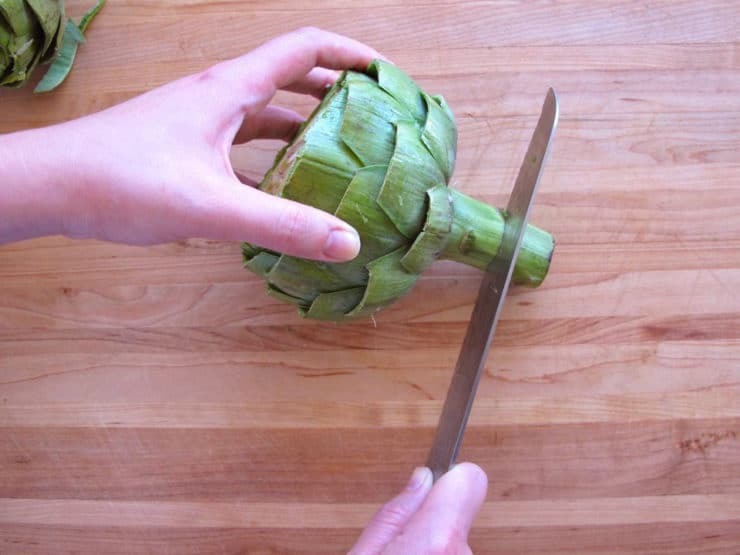 The artichoke is done steaming when you can easily insert a knife into the stem or heart (bottom) area. Cooking time will vary based on the size of your artichokes. Start with 30 minutes and go from there. I like my artichokes quite tender, but not so soft that they fall apart. This usually takes 1 hour or longer. 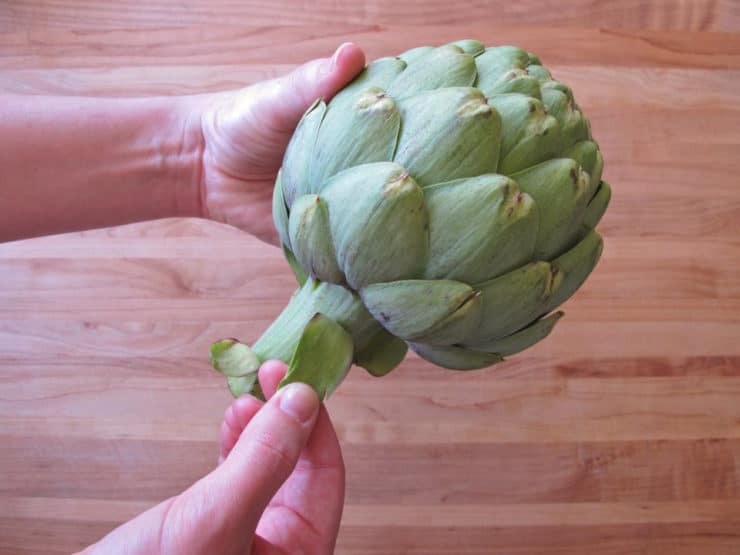 Once your artichokes are cooked, you can eat them leaf-by-leaf, or go straight to the heart of the veggie, which contains the most edible flesh. 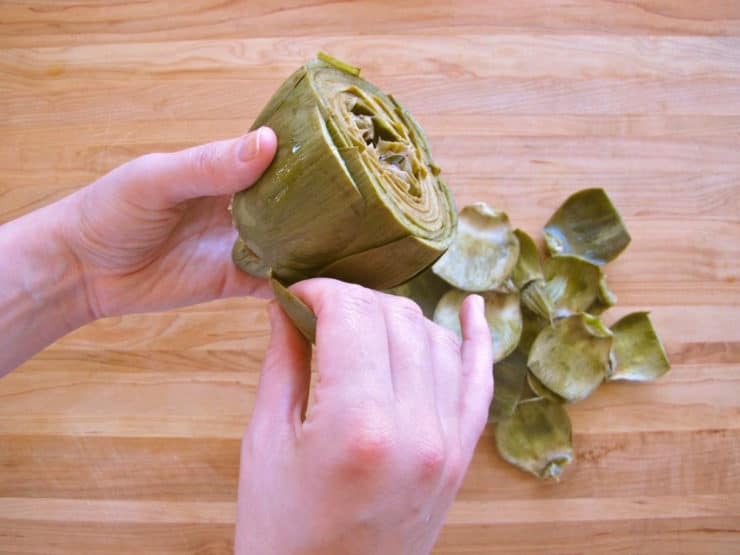 To eat the artichoke, remove the outer leaves by hand. They will come off very easily. For each leaf, place the edible meaty area at the base of the leaf between your teeth, then scrape off the soft edible flesh. Discard the uneaten leaf. Artichoke leaves taste great dipped in hollandaise, mayonnaise or herb sauce. One you get to the center of the artichoke, you'll see some very thin spiny leaves and a fuzzy "choke" area with small, tender spines. Pull off the thin leaves and discard. The fuzzy spines of the choke are also inedible, so you'll need to remove them with a spoon or melon baller-- simply scrape them gently off the heart, they should fall off easily. 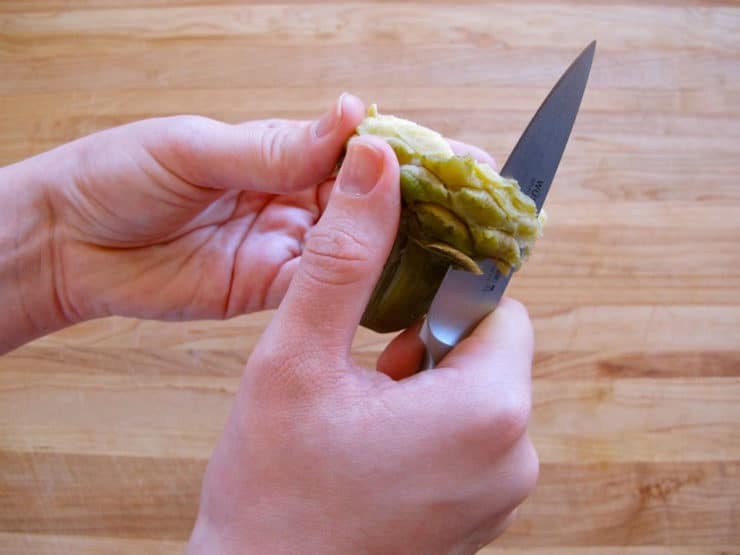 With a paring knife, carefully trim off any tough remaining bits of leaves from the outside edges of the heart. Voila! A cleaned artichoke heart. 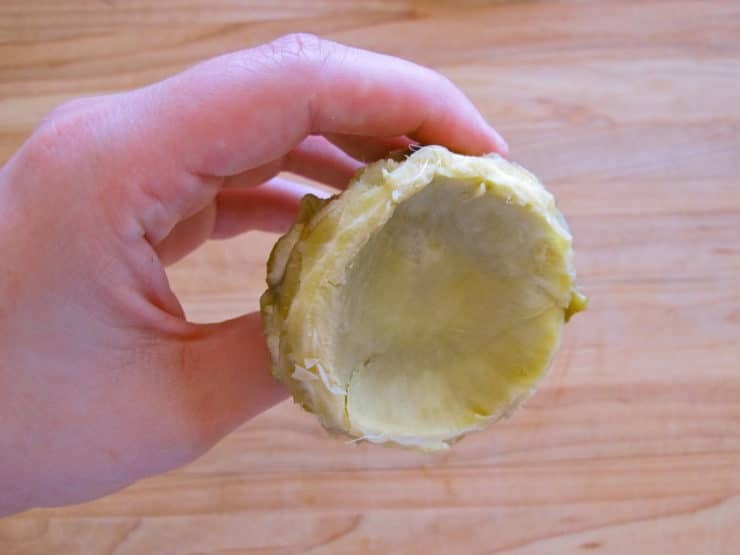 This is truly the most delicious part of the artichoke. Of course, you could just skip eating all of the leaves and go straight to the cooked heart... but where's the fun in that? 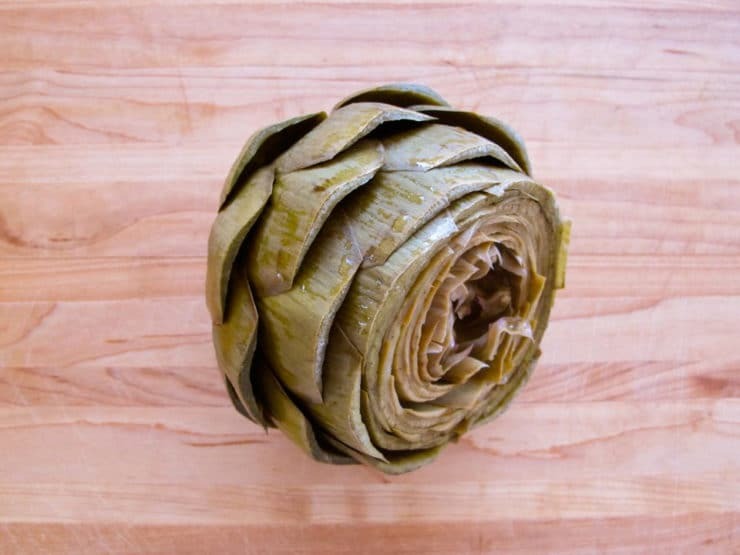 I always liked eating the leaves and working my way towards the center of the artichoke; it's like earning a prize when you get to the center. Dip it in sauce as you would the leaves, eat and enjoy! Beautiful tutorial! I had to compare with how I do mine – steamed are better than boiled, for sure! I didn’t think of rubbing the cut edges with lemon though before. Here we dip them in melted butter spiked with lots of lemon and salt. This summer for the first time ever we grew a plant in our garden in WISCONSIN! Most produce does not ripen here in any significant way until well into September, but anyway, these plant grew and made 5 or 6 of them! Some we ate, some are still growing! It’s just a giant thistle, very cool. I cook artichokes in a pressure cooker. They are completely cooked in about 10-15 minutes. You can cut off the steam & peel it & cook it separately from the main body. Tastes quite like the heart. I only remove the very base of the stem. Microwaving artichokes works very well. Simpler than steaming & quicker. I put mine in a microwave safe dish, add some water and cover with plastic wrap. Cooking time is about 1/2 hour.